The Day One Edition SteelBook comes with a physical version of Hitman, with over 100 hours of gameplay. It contains all Season One locations, updates and episodes from the Prologue, France and Italy to Morocco, Thailand, USA and Japan. It will also contain additional downloadable bonus content for those buying the disc-version and for everybody who owns the digital Full Experience or upgraded version of the game. - Three Bonus Missions Pack which includes The Icon and A House Built on Sand missions, plus the brand new upcoming Landslide mission. Sigh, someone at IO needs a punch in the face. @Scottie The glorious digital future - now affecting retail copies! I think we need a new system in place were digital releases are only followed by the physical copy a month later (after at least the day one patch). @Lurch - it's a retail disc version with 21GB of levels to download except you can't even download them. Colorado is level 5 of 6 as well i.e not the final level. The bonus missions also don't download. Plus the 3.6GB patch. Really, really poor. Why is level 5 not on the disc, yes you guessed it, that old chestnut, "It won't fit on one disc". FFS why didn't they use redeemable codes for the digital content instead of using whatever (magic?) they thought would work but doesn't. Poor! We're obviously aware of this issue (Colorado not installing) and doing what we can here to investigate what's causing it. We've also made Microsoft aware of the problem, to see if they can assist in any way too. I appreciate that it's hugely frustrating and want you to know that we are reacting to this issue and want to get it right as soon as we can. So the trick to this is to make sure you are online when you install from disc and select update now (22GB update) before it even installs from disc. The Colorado and Bonus missions will then be queued, along with the patch. "Therefore I am proud to announce today that IOI is now officially an independent studio. We have successfully concluded our negotiations with Square Enix and have agreed to a management buyout. Crucially, we will keep all of the rights to the Hitman IP. " 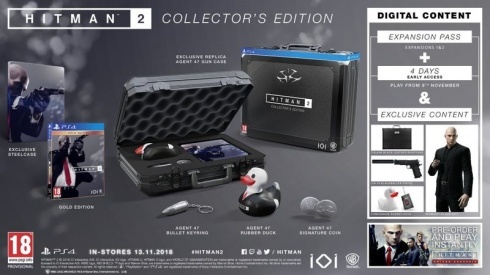 They say it includes Hitman season 1, but I'm guessing thats dlc?